Can you say Trail Rated!! Look closely at this sharp 2015 Jeep Wrangler Unlimited Sport 4x4 that just arrived here at Hometown. We just had this Jeep fully serviced too so you're 100% ready for work or play. Clean Carfax so you can buy with complete and total confidence. 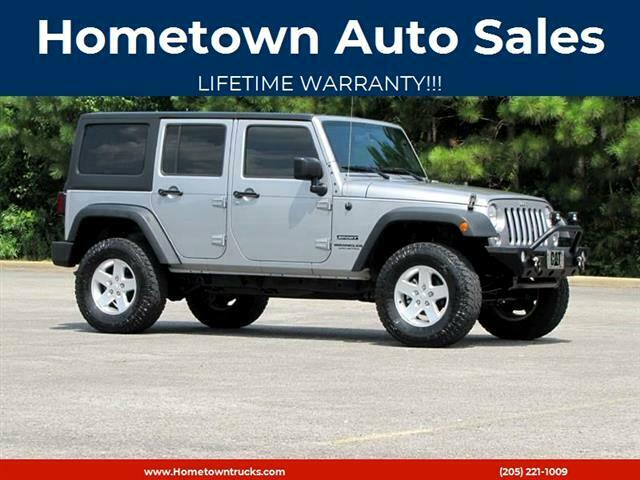 This Jeep drives and handles perfect and as you can see the interior and exterior look absolutely brand new. All power on the inside with tilt, cruise, keyless remote, tow package and much much more. You need to see this Jeep Unlimited in person. We offer bank and credit union financing here at the dealership, so you can drive this bad boy home today. Call Matt at 205 269 1297 or Ed at 205 275 9754. You can reach the office at 205 221 1009. Thanks! !